I am a royally confused person right now. All my identification papers say I am an Indian but I am not too sure whether I am indeed an Indian national. It starts with the fact that I have facial features that are "un-Indian" and that my origins are from a region that people in the rest of the country are more likely to locate somewhere in the Orient. It gets complicated given that there are some 40-odd armed groups in Manipur alone (where I come from) who are supposedly fighting for their own homelands and at one point of time were fighting to secede from the country. The latter bit is complex since most groups have suspiciously kept silent on the secession bit and instead taken to training their guns (literally) on the common man. The few who do know of the region are wary over my Indianness. They sneer and ask me straight on my face, "So, you don't consider yourself an Indian?" How do I begin to tell them that the great Indian love for Bollywood films has got to me so bad that a ban on Hindi films in 2000 by an armed group in Manipur led me to start writing? How do I convince them that when another armed group banned "Indian clothes" for girls and women in the state, I went on with my life dressed in salwar suits while rumours flew thick that women not wearing the traditional dress (phanek) were having their dresses shredded by razor blades? How do I tell them that every time I write about the freedom of choice, I am labelled an outsider in my community? And, how do I cope with being on the fringes of being an Indian and an alien in a country that refuses to embrace me and my brethren on one hand and accuses me of being the great betrayer of a community that carries the angst of being discarded? I have listened to too many anecdotes and emotional outpourings of how it feels to be an alien but cannot identify with that feeling of marginalisation. It may have to do with the fact that I have lived in Imphal, the capital of Manipur in the north-eastern part of the country all my life except for a three-year stint in Chandigarh where I did my graduation. It was then the time of four day-long road and train journeys from Imphal to Guwahati (by road) and then on to Delhi by train and then Chandigarh by road again. The train journeys were fun for me: inevitably someone would come up and try to chat up with our group. Sometimes it would be a child or a young man or an adult or a senior citizen. Every one of them would ask "Where are you from?". If I said "Imphal", they would say, "Oh! In Nepal?" and if I said "Manipur", they would get back with, "Is that in Japan /China/Thailand?" I eventually ended up carrying a diary with a map of India and would point out where I came from. And I would wonder what they were being taught in their geography classes! On the few occasions that I have been called a "Chinky", I have thrown back a Manipuri terminology they would never be able to decipher, "mayang thok". Mayang interestingly is how Manipuris label outsiders in our state while 'thok' pertains to something frivolous/not to be taken seriously. Looking "un-Indian" also had its "advantages": like the time I was put up in a five-star hotel in Delhi while attending a media seminar and I was given seven-star treatment by their event co-ordinator who thought I was some stinking rich foreign tourist who just might be interested in booking their hotel as a venue for a New Year party. I loved the way her jaw dropped when at the end of my stay, I said to her in Hindi that I had enjoyed my stay at the hotel. Once I head out of the country, immigration officials arch their eye-brows at the Indian passport I carry. In South East Asian countries, they speak to me in their various languages. My first trip abroad was to Bangkok and the reception folks had a banner with my name but when I happily walked up to them waving away merrily, they looked right through me! They were looking out for a salwar/sari clad, bindi/bangle donning, sharp-nosed and big-eyed person, and my small eyes and small nose just did not fit their mental picture of an 'Indian'. On a more serious note, I have heard horror stories of men driving past girls from the region in the streets of Delhi, shouting out abuses and from one account of a friend, having a beer bottle thrown at her. I have been lucky in a sense: I have never been physically targeted and have a thick skin when it comes to the leers and the taunts that I have been subjected to over the years during my visits to the city. I tell myself they should be ashamed to be Indians for not knowing their fellow countrymen. But many others from the region react with a bitter after-taste and say that "mainland Indians" will never make them feel they belong to this country. Some years ago, the Delhi police came out with a booklet called 'Security tips for northeast students/ visitors in Delhi', which went to great length to lay down guidelines for people from the region for "their own safety". The manual said people from the region should not call attention to themselves, that girls from the region should not wear revealing clothes and not go out on their own. The best (?) line in that manual was the one on not "cooking 'smelly' food without creating a 'ruckus' in the neighbourhood". I got a sneaky feeling that the handout inspired the recent Gurgaon police directive to its women population to stay indoors in the evening. 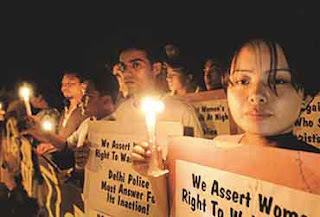 Cut to March 2012, and Delhi police are on the look out for anyone with small eyes and snubbed noses, who are likely to be accosted or picked up. A Tibet an activist immolated himself in a bid to call attention to the cause of Tibet in the light of the visit by the Chinese premier to the country and the city, and Delhi police stepped in by rounding up Tibetan refugees as "precautionary measures". The collateral damage touched people from the north-eastern region, going by news reports in some national dailies. While social networking sites are already buzzing with sarcasm, anger and indignation, the interesting bit was that one national newspaper, while quoting a Manipuri, described the person as a "Manipuri national". The Delhi high court has now stepped in with a directive to the Delhi police not to harass people from the Northeast and Ladakh because of their facial similarity with Tibetans. But there is more sense in taking up precautionary measures and I am going underground in Delhi by taking to the Delhi Metro with a vengeance just so I won't be picked up or hounded! And then I ask myself, "Am I Indian?"